Those who suffer through a dog bite attack can face devastating losses in several different contexts, including physical injuries, medical treatment costs, financial losses, emotional and others. Dog owners allow too many situations – thousands in fact – in California where people are injured in bite attacks. Dog bite law in California exists to provide people who have been wrongfully injured with an opportunity to make themselves as whole as possible after an incident. This is the same reason that laws exist with regards to car accidents, assaults, and other injuries. 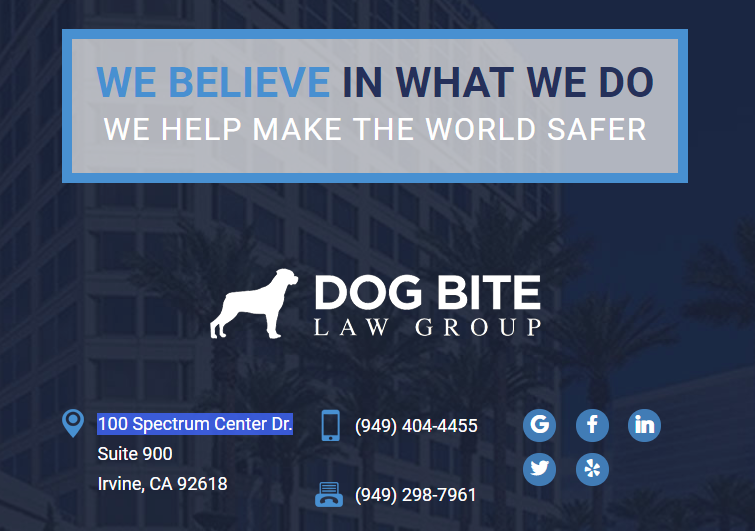 Our Irvine Dog Bite Attorney at the Dog Bite Law Group has helped countless people navigate and resolve these injuries, and if you face this situation you need to contact us as soon as possible to schedule a free consultation. Don’t wait, get help with a dog bite claim or lawsuit now. If you’re unsure of whether or not you should look into the possibility of filing a California personal injury lawsuit against the owner of the dog, we’d like to provide you with some information that will help you move your thoughts forward. The bottom line is that you can have your situation reviewed by our firm free of charge, so you have nothing more to lose. However, it still may be helpful to see how and why a California dog bite lawsuit could help you move on from what was certainly a terrifying and traumatic situation. Let the Attorneys worry about the severity of your injuries. Your loss is real, and your recovery is important. Do worry about thinking your case is too small. We handle case ranging from $5,000 to over $10 million. Every case matters, especially the one you might not do anything about. Contact the Dog Bite Law Group and we’ll walk you through your case and discuss your options to help your recovery. You don’t have to deal with the dog owner directly. We may contact the owner or folks responsible for the dog to get their insurance information. After that, we will deal with the insurance company and their lawyers. Speaking with an attorney will help determine if there is insurance coverage in your situation. When filing a claim or lawsuit it’s all about demonstrating risk to the insurance company and your leverage. Without a dog bite attorney, the insurance company knows you don’t have the leverage or experience with the system to create real risk with your claim. When you bring the Dog Bite Law Group to fight on your behalf, we bring the leverage and experience to demonstrate the risk when we deal with the insurance company and their lawyers. We take care of everything, so you can focus on healing and getting back to the way you were before this all happened. If you have been injured in a dog bite attack, it’s likely that you face painful injuries that could require surgery, ongoing medical treatment and other forms of therapy to help you get back to who and what you were before the attack as much as possible. Even if you have health insurance, you could still be facing an enormous amount of financial loss strictly from the medical bills that will have to be paid from your own pocket. When immediate and ongoing, longer-term medical costs in the wake of a dog bite attack are accounted for, it’s not uncommon for those losses to reach the level of tens of thousands of dollars if not more if extensive surgical procedures are necessary. You should not have to pay those costs for obvious reasons. You have enough to worry about with the situation into which you’ve been forced, and medical bills should not be part of your stress. When people are severely injured, whether it’s by a dog’s bite attack or in some other manner, it’s common for them to have to miss time at work. While many employees have sick days, personal days and the like that can help them cover their losses at least temporarily, those who are forced to spend days or weeks in the hospital or otherwise recovering from surgeries and the like can quickly face serious financial losses in the form of lost income. Once again, the dog bite laws in California exist to help people forced into this stressful situation recover that lost income, and that can include both wages lost immediately after the dog bite attack and those that an injured person will face in the future. An experienced Irvine dog bite attorney can help you place a value on those lost wages so you pursue as full a financial recovery as possible. Every situation is different, and you need to make sure that a California dog bite attorney evaluates your dog bite attack so that you can obtain an idea of damages and get help with a dog bite claim or lawsuit. If you’ve been injured in a dog bite attack, you may need to remind yourself that the dog owner and/or his or her insurance company have no interest in making sure that you recover the maximum amount possible to help you through this situation. Their interests are aligned on the opposite end of the spectrum. The dog owner wants to protect the dog and his or her financial interests, and the insurance company wants to minimize its own financial liability. The insurance company will know you’re serious if you hire an attorney. The insurance company will likely avoid low-balling your attorney with settlement offers. The other side will understand that you won’t hesitate to file a lawsuit if necessary. The other side does not want to incur the costs of defending the lawsuit in most cases. You will have access to medical experts to fully evaluate all of your injuries and treatments. Those medical experts will be able to testify to your situation with a high level of expertise. Basically, the dog owner and the insurance company will understand that they need to avoid playing games and doing what they can to get you to take less than you deserve in terms of your financial recovery if you work with a California dog bite attorney. You have a lot to fight against and deal with as it is. The best way to deal with any significant challenge is to do everything within your power to handle what you can control. In terms of pursuing and maximizing your financial recovery and holding the dog owner accountable for the actions of his or her animal, you need to rest assured that you’ve obtained the help of a California dog bite attorney who will fight relentlessly for justice. That knowledge could help you overcome the other challenges you face. There is a reason that, when a dog hurts someone, it can be classified either as dangerous or vicious under California law. That reason is that society needs a way to put the dog owner responsible for those injuries on notice that (a) he or she needs to take significant steps to properly handle that dog and (b) the public needs to know about the risks associated with this dog. If you’ve been injured in a dog bite attack, get help with a dog bite claim or lawsuit that could lead to that dog being classified by your local animal control authority. This could prevent that dog from hurting someone else in the future. Dog bite attacks are traumatic and sometimes tragic. Unfortunately, they occur often and when they do those who have been harmed need to take steps to protect their legal rights. If this includes you or someone you love, get help with a dog bite claim or lawsuit by contacting John Michael Montevideo at the Dog Bite Law Group today to schedule a free initial consultation.